1. No one loves this anime- hence no good reviews. 2. No one hates this anime- hence no bad reviews. 1. 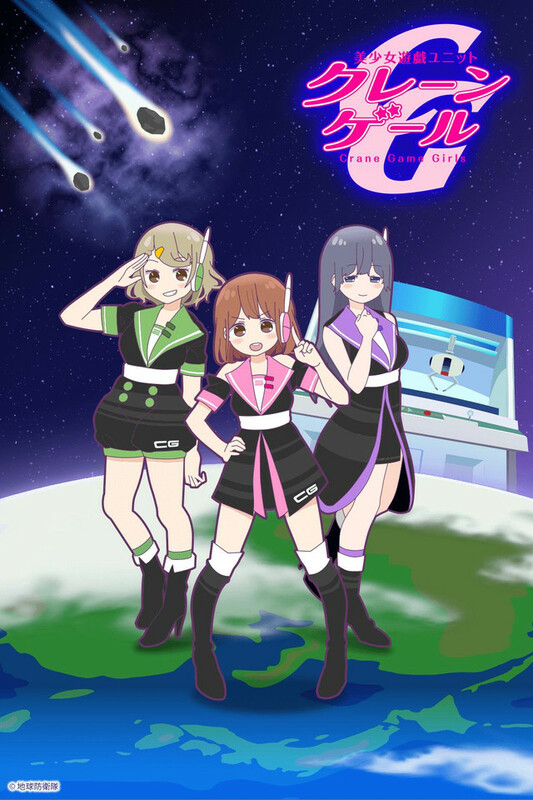 Story: The premise of three girls wanting to be idols but secretly training to save the world by mastering "crane games" in arcades is something a 4 minute anime would do -_- but whatever. The story is not what's going to keep you viewing, but the characters might. However by episode 5 the girls are STILL just playing crane games trying to get a gorilla out of a vending machine. But episode 4 is heartwarming as we learn about the purple girl's family and stuff (but not really)..
and um.. that's it..this anime doesn't offer much more of anything. In conclusion, I don't hate it. And you won't either. .the anime does not try to be more than it should be. Just some silliness you can leave on in the background to be honest. Crane Game Girls is a short-form anime series which follows three girls who are want to become idols. They are hired on to work at a game store to train fervently on crane games because statistics show that Idols are much better at crane games than the average person. Apparently. That said, what they do not know at first is that while playing these crane games using various techniques for winning prizes they are powering lasers which knock off-course asteroids which being hurled at the planet by some unknown source. Seem confusing and nonsensical? That’s because it is. Yet, as a short-form series it works. Humor lies in the ridiculous, over the top nature of the show. The interactions between the characters who are all taking their roles way too seriously are silly. Attempts at seriousness fail delightfully and are played up for laughs as the teen girls make silly quips and jokes about what it means to be an Idol. The animation is simplistic like a classic Flash animated show, but vibrant and colorful. The style works for this silly show. Nah, didn't work for me. I really didn't know what I was expecting with this. It ultimately was five minute flash videos with a two minute OP. The world is pretty awful looking. Heroes are qt, but not qt enough to warrant sitting through this bizarre series. Then again, I gave up by the third episode when I realized it wasn't getting any better.